I love anything and everything that can help give me a boost of Collagen, so when I heard about the new Amazonia Raw Collagen Glow 5000 and that it actually contains different 'types' of Collagen, I knew I had to find out more for us! Thanks to our friends at Amazonia, I have put together this blog to answer our questions. Just when I think I know everything about natural health supplements, every now and then a new inner beauty powder comes along and blows me away! 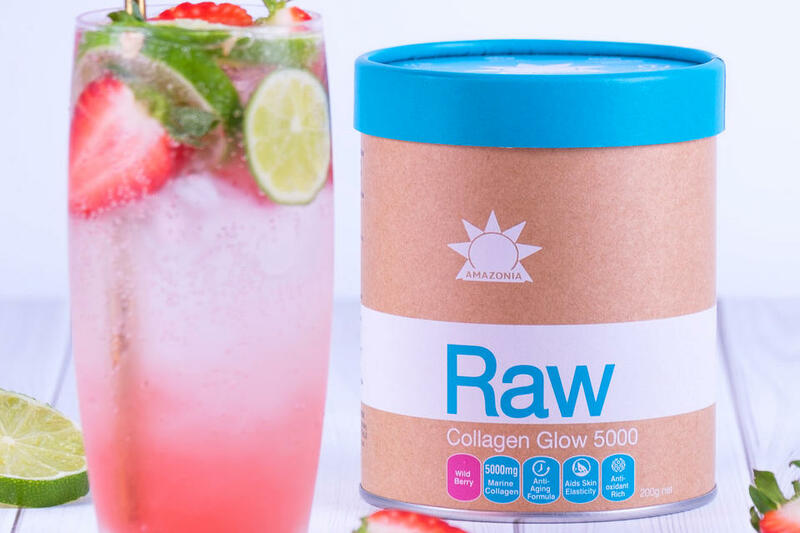 When I first heard about the new certified organic Amazonia Raw Collagen Glow 5000 I was actually amazed because I had no idea there were different types of collagen... I was so intrigued I had to have all our burning questions answered! I know I talk about the benefits of collagen for skin a lot, but who doesn't love a delicious supplement which can give our morning smoothies a boost of flavour while also giving us smooth and glowing skin, shiny hair and strong nails?! Where does this Collagen come from? The collagen in Amazonia Raw Collagen Glow 5000 is derived from marine (fish) sources. Marine Collagen is highly bioavailable and has a low molecular weight compared to other sources, making it fast absorbing into the bloodstream. This makes it easier for our bodies to use and fast to replenish collagen stores, making it the ideal source to help improve skin elasticity, promote thick hair, strong nails and youthful, firm skin. There are actually various types of Collagen, including Types I, II and III. Type I makes up the majority of our skin, Type II our joints and cartilage, and Type III a combination of both. 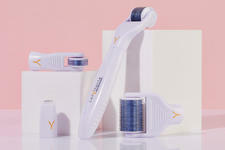 What type of Collagen does Raw Collagen Glow 5000 contain? Marine Collagen contains Types I and III, both known to help support skin firmness and elasticity and reduce the appearance of wrinkles. Amazonia Raw Collagen Glow 5000 contains 5000mg of Type I and III Collagen. Collagen and Gelatin are actually derived from the same sources - bones, connective tissue and skin, however they are not exactly the same thing. Collagen is found in bones and tissue, however cannot be eaten easily, so these parts must be cooked to make the actual collagen digestible. When these parts are hydrolyzed and dried, Gelatin powder is formed - this means that Gelatin is the result of cooked Collagen. Another big difference is how they are processed. Collagen peptides are a more processed version through hydrolysis, so the smaller protein particles can be more easily digested and absorbed by our bodies. When mixed with water, Gelatin is generally thicker and jelly-like in consistency, whereas Collagen is similar to a fine powder and can be easily mixed into liquids or recipes. What else does Collagen Glow 5000 contain? This formula also includes powerful inner beauty ingredients such as Sea Buckthorn Juice (40mg/serve Vitamin C), which is high in Vitamin C, known to help support Collagen production. Vitamin C can also help to brighten and rehydrate skin from the inside out. Beetroot (100mg/serve) is also included for its high antioxidant content, working to protect the skin from free radical damage. Another core ingredient is Jerusalem Artichoke Inulin, a wholefood prebiotic which works to feed and nourish good bacteria (probiotics) in the gut. 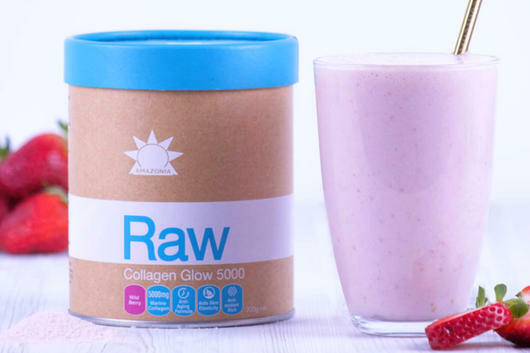 Amazonia Raw Collagen Glow 5000 has a subtle yet refreshing natural wild berry flavour. This inner beauty powder can be used in so many ways - it is perfect just mixed in water but can also be added to coconut water, juices, smoothies, breakfast bowls and other recipes. Simply mix 1 heaped tablespoon into liquid or food once daily. 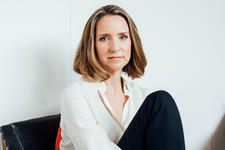 Is Collagen Glow 5000 safe to be taken during pregnancy and breastfeeding? All ingredients are naturally derived from wholefood sources, but we recommend speaking to your healthcare professional before use. Mix all ingredients together in a blender until smooth.